Ideas about physical education for young women changed dramatically over the lifetime of Chevy Chase Junior College. In the 1911 school catalog, Dr. and Mrs. Barker described the “proper carriage of the body” as the goal of their program for dancing and physical training. In subsequent catalogs, photographs of Chevy girls playing team sports suggest a shift in their philosophy of physical education, and in 1927, the school catalog promotes the “healthfulness” of sports and the importance of “physical vigor.” Like many other elite private schools and colleges for girls, intramural team sports were played; at Chevy Chase School, the teams were identified as the Blacks and the Golds, reflecting the school colors. 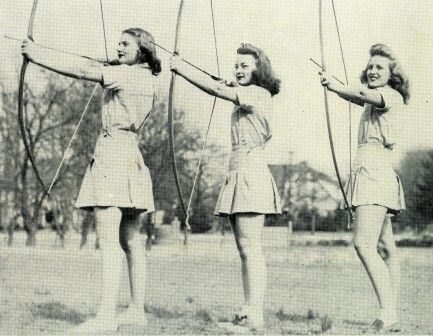 By the 1940s, the college catalogs and yearbooks present a glimpse of a full and varied physical education program, with an archery team called the “Chevy Amazons.” Although the Chevy teams never competed with other schools, physical education became a central element of the school curriculum.